Today NASA held a press conference announcing the first demonstration that organisms could use arsenic in place of phosphorus in their cells. Not surprisingly, science fiction got there first . . .
Kirk told [Bones] about the tabekh sauce. Bones nodded at that and said, "Yes, I've heard of it. I don't think you'd want to try it, though." "One of the other ingredients is arsenic." "Apparently they like the bitter taste," Bones said. "Also, the arsenides are pretty important in their diet. Klingons can get into horrible arsenide deficiencies if they're not careful, especially in stressful situations –"
While Klingons need a bit of arsenic in their diet, the element is a deadly poison to humans and most other Earthly life forms. A big part of what makes arsenic toxic is that it has very similar - but not identical - chemical properties as phosphorus, one of the fundamental building blocks of life. 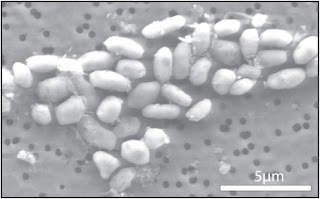 GFAJ-1 bacteria grown on arsenic. Because of the similarities between the properties of arsenic and phosphorus it's natural to speculate that organisms could evolve so that they could use arsenic in place of phosphorus. Dr. Felisa Wolfe-Simon, a geobiologist with the US Geological Survey had been testing that idea by studying bacteria living in California's Mono Lake, which has naturally high arsenic levels. Wolfe-Simon's work is funded by the NASA Astrobiology Institute, and back in March she explained why finding arsenic-based life would be an important step in possibly understanding alien life. Dr Wolfe-Simon has theorised that there may be life that chose an “evolutionary pathway” to utilise arsenic. If such microbes existed, it could suggest that life started on our planet not once but at least twice. In turn this would help to support the idea that life is much more likely to have started elsewhere in the galaxy. It's a pretty interesting speculation about alternative biochemistry, and I don't think it's too surprising to find the idea has already been played with in science fiction. The best example I can think of is science fiction author and microbiologist Joan Slonczewski's novel Brain Plague (Amazon.com ). The story is about sentient arsenic-dependent microorganisms called "micros" that live in colonies in human hosts. "Oh Great One" the letters flashed green. "Our growing children need arsenic." "Arsenic" Chrys looked up. "Isn't that what the slaves kill for?" On the street they called it "ace." Doctor Sartorius extended an appendage. A claw snapped open, revealing a white pill. "Micros evolved on a plenet full of arsenic. They need it as an essential mineral." "It's a controlled substance," the doctor admitted. "But our dietary supplement traps the arsenic in special cagelike molecules that keep it out of your own cells. Only the micros can extract it." Slonczewski acknowledges fellow microbiologist Barry Rosen, who studies arsenic resistance in microbes, for "telling her about arsenic." But until today, the idea was still speculation. NASA held a press conference today to announce - after much wild speculation and hoopla - Wolfe-Simon's experiments had shown that the bacteria from Mono Lake could indeed use arsenic in place of phosphorus. Wolfe-Simon and her team of researchers took samples of lake sediment containing bacteria (named GFAJ-1). The bacteria were placed in a medium in which all phosphorus has been removed, but arsenic was present - and they grew. If arsenic was also removed from the medium, the bacteria stopped growing, so either phosphorus or arsenic are necessary. Their experiments further show that when phosphorus is not present, arsenic is incorporated into DNA, cellular membranes, proteins and other molecules where phosphorus is normally found. It is important to note that the bacteria grow much better when phosphorus is present, which means that they aren't truly "arsenic based life". But the fact that the bacteria don't need phosphorus is a major finding that challenges the common wisdom as to what constitutes the necessary components for life. While carbon, oxygen, sulfur and nitrogen are still commonly required by all the living organisms that have been studied, now we know that an environment - on Earth or any other planet - without phosphorus may indeed support life if there is arsenic to take its place. "If something here on Earth can do something so unexpected, what else can life do that we haven't seen yet?" For more about the science, check out posts by Athena Andreadis, Ed Yong, Sarah Goslee, PZ Myers, and Jef Akst. Edited to add: Carl Zimmer has an article in Slate about the technical criticisms that have appeared regarding the science in this paper: "Scientists see fatal flaws in the NASA study of arsenic-based life." In particular, he points to University of British Columbia microbiologist Rosie Redfield's scathing review of the article. Also see the responses by George Cody and Alex Bradley. 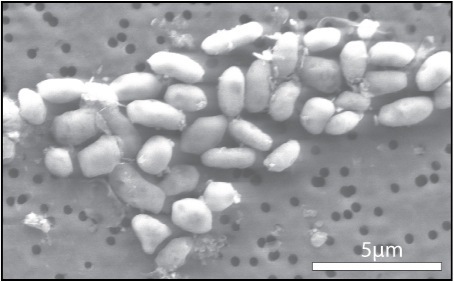 Wolfe-Simon F., et al "A Bacterium That Can Grow by Using Arsenic Instead of Phosphorus" Science Express (2010) DOI: 10.1126/science.1197258 (abstract only without subscription). NASA scientists have discovered a new extreme-loving microorganism in California's exotic Mono Lake (2003) - note that this is a different organism, Spirochaeta americana. Mono Lake is full of weirdness! Terrific post, Peggy, and thanks for the signal boost! The SF references are great. I've read Brain Plague, but didn't remember that particular wrinkle. As for the real world, this is not necessarily true: "If such [arsenic-utilizing] microbes existed, it could suggest that life started on our planet not once but at least twice." As is the case with this group's experiments, you can have retroactive adaptation. Hence my grumpy note that this is nowhere near showing evidence of a shadow biosphere. You're right that this particular experiment doesn't at all support the idea that there was some sort of parallel evolution of arsenic-utilizing organisms. But I do think it's true that discovering arsenic-but-not-phosphorus-utilizing microbes "could" support parallel evolution. It would depend on what bugs like that were actually like biochemically. That waffling "could suggest" makes the statement generic enough to be technically true, even if it's extremely improbable. Your title reminded me of the Poul Anderson book, The Man Who Counts. In one of the stories Nicolas van Rijen and company are stranded on a planet where life uses proteins so different from terrestrial that all food is poisonous to humans, and visa versa. The indigenes are involved in a war, and have no time to help the humans get the attention of other humans who might get them off the planet. van Rijen needs to have one of the alien leaders go away, and provokes him into an argument. The hero then turns his back on the alien, a deadly insult in their culture. The alien's programed response is to bite the offender. He takes a big bite out of van Rijen's buttocks, swallows the bite, and promptly dies. So van Rijen's meat was his poison. I think to many writers seem to feel that any planet we find ourselves on will have life so compatible to ours we'll just be able to shoot the turkey analogue and serve it for dinner. Might not work that way. And, according to you article, it might be due to their arsenic content.